What might be the cause of this dog’s third eyelid protrusion? The change has come on slowly and does not seem to bother the animal. The dog seems somewhat to resent mouth opening but not to the extent of showing it to be painful. There is a mild serosanginous nasal discharge on this side. The eye is somewhat exophthalmic, explaining the protrusion of the third eyelid. It always seems strange to me that both exophthalmos and enophthalmos (for instance in Horner’s syndrome) give rise to a third eyelid protrusion. If you can explain that to me please do send me an e-mail! The slow development of this and the relatively painfree mouth opening are omminous signs suggestive of tumour rather than inflammatory changes. The nasal discharge is worrying to isn’t it? 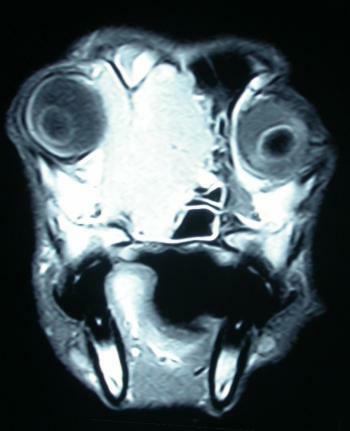 Sure enough an MRI, as shown here, demonstrates amazingly profound infiltration of the orbit by a nasal tumour for the limited exophthalmos. Dealing with a tumour which has developed this far without giving the dog a severely compromised end to its life is very difficult in my mind. I’ll let you know when we have the biopsy results obtained through a nasal endoscopy. Thanks to the oncology team at Cambridge for a chance to look at this interesting but rather sad case. At least the dog is happy and feeling well at present. 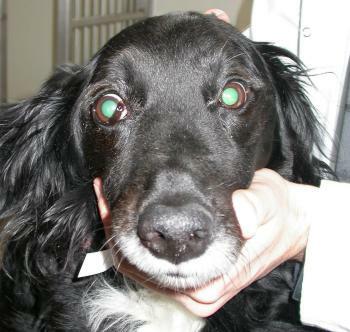 This entry was posted in Cases and tagged dog, exophthalmos, orbital space occupying mass. Bookmark the permalink.